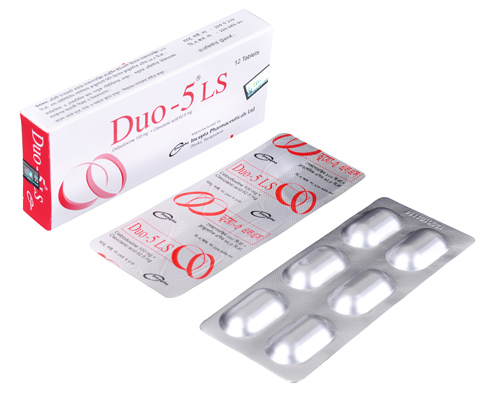 Duo-5 LS: Each film coated tablet contains Cefpodoxime 100 mg as Cefpodoxime proxetil USP and Clavulanic acid 62.5 mg as diluted potassium Clavulanate BP. 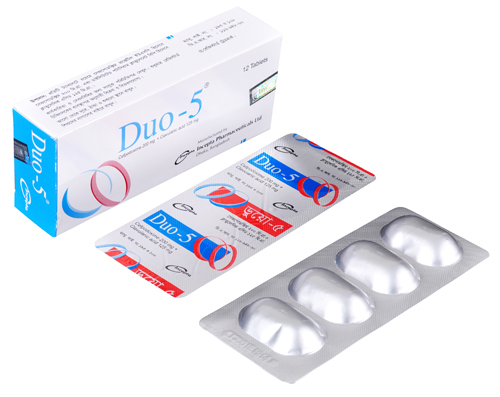 Duo-5 : Each film coated tablet contains Cefpodoxime 200 mg as Cefpodoxime proxetil USP and Clavulanic acid 125 mg as diluted potassium Clavulanate BP. Cefpodoxime-Clavulanic acid is a combination of two drugs and is effective against multiple infection types. Clavulanic acid component protects degeneration of cefpodoxime in presence of beta-lactamase enzymes and increases the antibiotic spectrum. Clavulanic acid in cefpodoxime-Clavulanic preparation prevents the resistance to Cefpodoxime that may increase with continuous usage of the drug. It has shown effectiveness against multiple Gram-positive and Gram-negative bacteria and is generally well tolerated. General gonorrhea and rectal gonococcal infections. Patients with renal dysfunction: For patients with severe renal impairment (< 30 ml/min creatinine clearance), the dosing intervals should be increased to 24 hourly. In patients maintained on hemodialysis, the dose frequency should be 3 times/week after hemodialysis. Patients with cirrhosis: Cefpodoxime pharmacokinetics in cirrhotic patients (with or without ascites) is similar to those in healthy subjects. Dose adjustment is not necessary in this population. It has very few side effects. The side effects include diarrhoea, nausea, skin and vaginal fungal infection, vulvo-vaginal infections, abdominal pain and headache. Cross hypersensitivity in penicillin sensitive patients, leading to serious acute hypersensitivity reactions may need treatment with epinephrine along with other emergency measures such as intravenous fluids, oxygen, airway management and intravenous antihistamine, as clinically indicated. Cefpodoxime is pregnancy category B. And Clavulanic acid is pregnancy category B.